The innovative curriculum of Deep Creek Middle School meets all Bahamian Ministry of Education requirements and provides additional programs to support the vision, mission and learning outcomes of the school. Core academics include math, English, science, social studies, health, arts, life skills, physical education and religious knowledge. These core courses are supplemented with special programs designed to promote the DCMS core values of leadership, responsible citizenship, and academic growth. These include Community Outreach clubs (Eco Club, EarlyAct, Wellness Club), SCUBA, School Without Walls, Advisories and Summer Bridge. DCMS also provides opportunities for students that further support their learning by participating in after school sports, Junior Junkanoo, international summer camp, and boarding school preparation. The DCMS Social Studies curriculum examines how geography + history = culture, combining the objectives of the BJC Social Studies curriculum with a continual focus on the power of communities to shape their own futures. In seventh grade, students learn principles of mapping and ecology to explore how place shapes human activity, and eighth-graders study how different peoples have interpreted “civilization” over 500 years of Bahamian history. Ninth-graders analyze the social institutions that have impacted The Bahamas, from the Transatlantic Slave Trade to contemporary Bahamian government, in order to understand and transform the structures that influence their lives. The curriculum develops students’ abilities to write, pursue independent research, and debate. DCMS field trips bring it all to life. The math curriculum is a spiraling curriculum in which concepts are revisited each year. Seventh grade serves as an introduction, eighth grade provides an opportunity to master the skills, and ninth grade requires students to apply their knowledge and skills into real-life situations. The curriculum focuses on problem solving strategies and incorporates real-life problems and situations to make the students equipped for the challenges they are facing outside of school. The units range from number theory with reviews of basic operations, fractions, decimals and percent to statistical analysis and probability with collecting data, to symmetry, geometry and algebra. Science classes at DCMS are developed using curriculum put forth by the Ministry of Education with strong emphasis on a minds-on, hands-on approach to learning. Grade 7 science largely focuses on introducing students to science: What is science? Who is a scientist? What skills do scientists utilize? 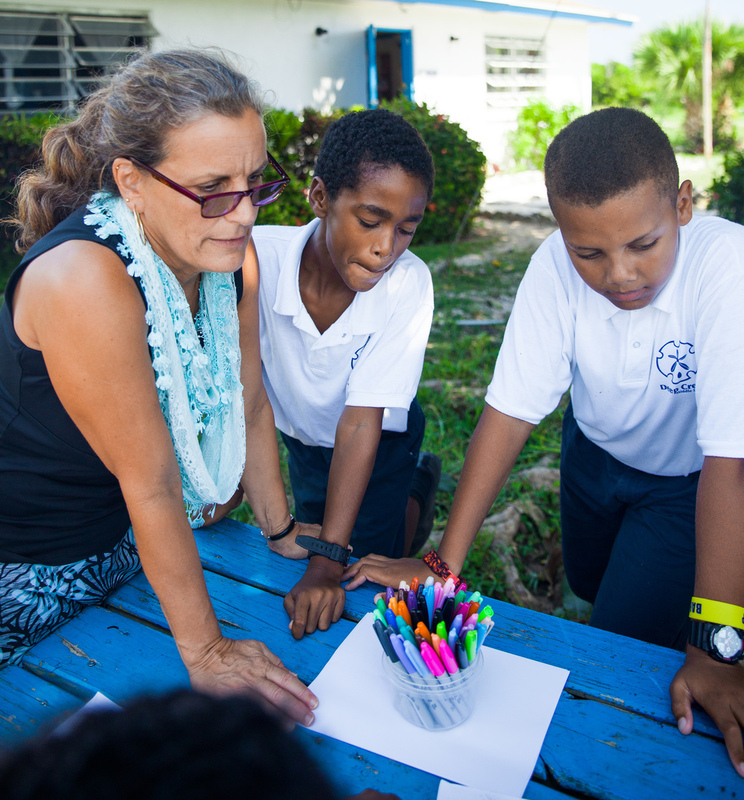 In addition, grade 7 students study the marine ecosystems of The Bahamas and its native organisms by immersing themselves in Eleuthera. What better way to learn about the interconnectedness of this place than to snorkel reefs, mangroves, and seagrass beds? Students conclude the year with an introduction to animal and plant cells. Grade 8 science focuses heavily on chemistry. Students study matter and its properties, the periodic table, the formations of compounds, acidity, and engage in a highly experimental unit on mixtures and solutions. In addition, students explore the carbon and nitrogen cycles and how humans alter these cycles. Grade 9 science at DCMS kicks off with a unit on energy. For the first half of the year the students learn about light, sound, and heat energy and how these principles relate to SCUBA, a class offered only to grade 9 students. Later in the year, students explore simple machines, electricity, and magnetism. The English curriculum is grounded in the belief that reading and writing engage us with ideas and the world, and connect us to each other; it focuses on increasing literacy and improving writing skills in preparation for the English and English Literature BJC examinations. The building blocks of reading and writing are taught through Reading Workshops, literature studies, Writing Workshops, vocabulary study, drama and nonfiction analysis. There is a strong emphasis on developing a culture of literacy and critical thought, in and beyond the classroom. Health and Wellness teaches the importance of all around good health providing students with knowledge they need to make informed decisions about their physical, social, spiritual, environmental, and emotional health as they mature. Health and Wellness offers rich content and helps students learn how to use critical thinking to become problem solvers and lifelong learners. Our goal is to prepare students with the skills to live healthy and happy lives. In grade 7 we touch on nutrition and fitness, values, puberty, sexual health, and human sexuality. In grade 8 we cover communication, love and relationships, diversity, drugs and alcohol and many more topics. Grade 9 focuses on human anatomy and physiology in preparation the the BJC exam. The Art curriculum is focused on visual art and art integration across disciplines. Students are introduced to the technical skills and concepts necessary to produce quality artwork while they are encouraged to problem solve across academic disciplines. Students learn that we can use art as a lens for examining environmental issues and investigating social justice. We can understand identity and culture and recognize the role that the Arts play in society and our personal lives. In developing our appreciation of Art and increasing our skills, we prepare not only for the BJC national exam in art & design, but also collaborate and support each other’s creative process. The Bahamian Ministry of Education religious knowledge curriculum is an introduction to the study of the Bible and the life of Jesus of Nazareth. The purpose of the course is to teach students the role spirituality and the church can play in their lives. It also provides students with a moral guide for making decisions as they move through adolescence into adulthood and prepares them for the BJC exam. This part of our curriculum is unique to DCMS. The following courses and programs are specially designed to provide students with opportunities to practice the core values of leadership, academic growth, and responsible citizenship in authentic, place-based learning environments. The Community Outreach goal is to come together as a community to take ownership of our place, DCMS, not only in the classroom but also outside its four walls. Through our three clubs, Eco Club, EarlyAct and Wellness Club, DCMS students explore what it means to be responsible citizens through collaboration and project implementation. Every student must commit to being involved in a community outreach club. Club time has been scheduled into the school day and each club will focus on community needs through its particular lens. The culmination of the community outreach program takes place in Spring Term when our 9th graders work together to lead multi grade level teams and focus on an outreach project in the greater Eleuthera community. The EarlyAct Club at DCMS is made up students who believe in putting service above self. This organization is a junior arm of the Rotaract Club and collaborates closely with The Rotaract Club of Eleuthera. The students are committed to developing citizenship and leadership qualities by identifying and taking responsibilities for real life problems within their school, local and global communities. The Eco-Schools club is an extracurricular organization initiated by grade seven students in 2009 with the mission of making DCMS more environmentally friendly. The group did environmental assessments in the areas of waste, water, energy, and biodiversity and created action plans to tackle pressing problems. Seven pilot projects were undertaken including experimenting with systems for food waste, creating a healthy snacks garden, and changing all incandescent light bulbs to CFL’s. The group is currently working on a major project to reduce the amount of waste we send to the dump and has built a school-wide recycling system which handles aluminum, plastic, and paper waste. Their motto is: DCMS can be green if we work as a team. For the fourth year in a row, a team of Eco Club representatives have been selected to attend the Algalita POPS International Youth Summit at the Ocean Institute in Dana Point, CA in 2017! The Wellness Club started in 2016. Students endeavor to assess the wellness needs of their community, generate innovative wellness ideas, plan events, model a healthy lifestyle, and engage in community outreach opportunities. Students involved in wellness club can also expect to learn practical health and wellness skills which may include learning how to make healthy meals and snacks, fun ways to exercise, strategies for coping with stress, first aid skills, and how to help those in need in our community. We look forward to supporting the growth of this exciting club! During the Fall and Spring Island School semesters, DCMS students team up with Island School students to exchange cultural understanding and develop lasting friendships around shared activities. This year the focus of those activities will be around a sense of place, settlement exploration, physical literacy and friendship. During the 2017-18 school year, School Without Walls will be three separate one week sessions spread across Fall Term and Winter Term. This is a focused time of experiential education and exploration of Eleuthera in collaboration with other parts of the Cape Eleuthera Island School and other organizations on Eleuthera. Extended time will be spent out of the classroom working on grade level themes focused on the marine world, research and student advocacy. Students will share and celebrate their learning with the larger community through an evening of Presentations of Learning. Students have a unique opportunity to demonstrate some of their cumulative learning through our Grade 9 Collaborative Graduation Projects. Based on specific instruction they receive in their Community Outreach Club, grade 9 students come together to design, implement and collaborate on meaningful community service projects. The skills curriculum covers a wide range of subjects to support the middle school child’s developmental success as students, young adults, and future leaders. The skills program is focused on grade 7 students and covers study skills, computer literacy, and community building. Leadership, communication, conflict management and decision-making skills are also introduced and practiced throughout the DCMS program. In 9th grade, students at DCMS work towards a PADI certification through open water SCUBA diving. Students learn to dive safely through a combination of classroom lessons, contained water skills instruction, and open water dives. PADI certified instructors from the Island School lead weekly dives that teach basic diving skills, expose students to the local marine environment, and build teamwork and perseverance. Underwater graduation takes place at the completion of the course. DCMS also offers opportunities for students to continue realizing our vision beyond the school day and their DCMS careers. All students at DCMS are encouraged to be physically active. Throughout the year, students practice after school to learn the skills and strategies of a variety of sports and build their physical literacy. A special emphasis is put on teamwork, sportsmanship and lifelong physical activity. Students in grade nine may consider attending the local high school or applying for boarding schools in the United States. DCMS supports students and families with the process by helping with applications, school contacts, interviewing and placement. DCMS graduates have earned over $1.5 million in scholarships over the last six years. Alumni attend or have attended the following schools: Episcopal High School, Garrison Forest School, Hebron Academy, Kimball Union Academy, Lawrence Academy, Lawrenceville School, Marvelwood, Proctor Academy, Trinity Pawling School, and Vermont Academy. View alumni profiles to read about the achievements of DCMS graduates who have attended boarding school. Junkanoo is a distinctly Bahamian cultural event involving music, dance, and colorful handmade costumes. All fall, communities come together to prepare for the Boxing Day or New Year’s Day rush. A rush involves a parade of colorful costumes created within specific parameters; intricately choreographed dances; and the rhythmic sounds of cowbells, drums, horns, and whistles. At DCMS, the students compete in the all-island Junior Junkanoo rush in late January. Students work to create the theme; choreograph the dance; make the cardboard, wire, and paper costumes; and practice for their performance. Students in all grades can apply for full scholarships to summer camps in Canada, the United States, and The Bahamas. This opportunity allows students to act as ambassadors for DCMS, meet people from all over the world, and travel internationally. The campers try many new activities such as canoeing, rock climbing, hiking, sports, and arts projects. Past summer camps have included: Camp Kiniya, Camp Dudley, Camp Deerwood, Surf Camp Bahamas, Camp Betsey Cox, and Camp Queen Elizabeth.